Sutphen demo truck graphics including the Sutphen maltese cross. Sutphen's demo graphics are proudly displayed throughout the Limited Edition engine...from the Patriotic grill to the Sutphen maltese cross on the cab doors. The first museum grade Sutphen Limited Edition engine. Countless hours of design, proofing, and improvements make this replica museum grade, from the stainless steel grill, to the individual lenses on each scene light. Production limited to an elite 100 units. The 2017 Limited Edition Sutphen is limited to 100 units. Fire Replicas are designed with the elite collector in mind, and manufactured in limited quantities to enhance future value. The replica measures 8"L x 2.5"W x 2.5"T and is securely displayed inside a custom case. 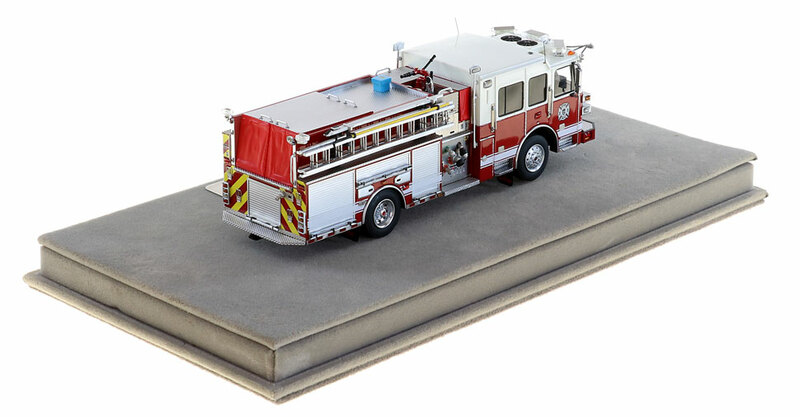 The case dimensions are 12"L x 6"W x 5.25"T and the platform includes an etched stainless steel nameplate with the Sutphen logo and truck name. This Sutphen Monarch Custom Engine - 2017 Limited Edition scale model is a museum grade replica. Like all Fire Replicas models, every detail is modeled to perfection and with razor sharp precision. The replica features the specific department configuration and graphics, leaving no detail overlooked. The display case is custom manufactured with high quality acrylic and resin. The stainless steel etched plate features the department and truck name, and department seal. This replica is a treasure to be displayed and admired and is in no way a toy. This is a well crafted and engineered piece of museum quality memorabilia. My second piece for the Sutphen Monarch custom engine is just outstanding! Fire Replicas has produced an amazing life like Sutphen 1:50 scale replica pumper, the detail with every aspect of a real Sutphen pumper has been identically captured with this model from the cab with it's unique Sutphen style curve's & warning/headlight bezel's to the American flag style grill. The color scheme of white over red is a perfect color scheme for this rig, I love the Sutphen look of their apparatus and Fire Replica's has 100% replicated a true "museum" like scale Sutphen engine with outstanding detail throughout this model! 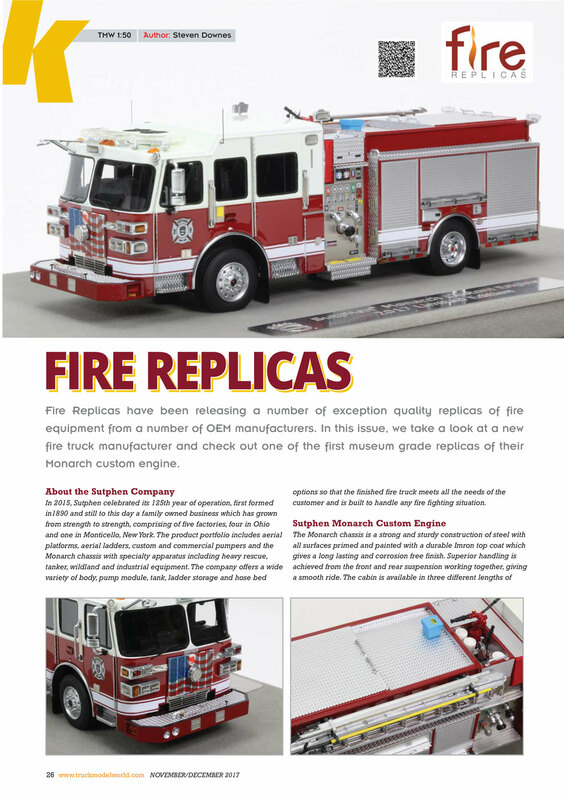 Thank you Fire Replica's for such awesome collectible fire apparatus diecast replicas. Look forward to more Fire Replica's fire apparatus models in 2018. All of Fire Replicas releases have been great - but this is definitely a top 3 pick for me. The colors scheme is great, the US flag on the grill is AWESOME and the fit, finish and detail is superb. The Sutphen pumper is a beauty and looks great as is - but this one certainly lends itself to customization as well. I already have picked up two of these and probably will get another! Thanks Fire Replicas!!! True museum quality replica Sutphen pumper. This new Sutphen limited edition engine adds yet another awesome replica to my collection. Attention to detail in every aspect of a true museum quality piece. 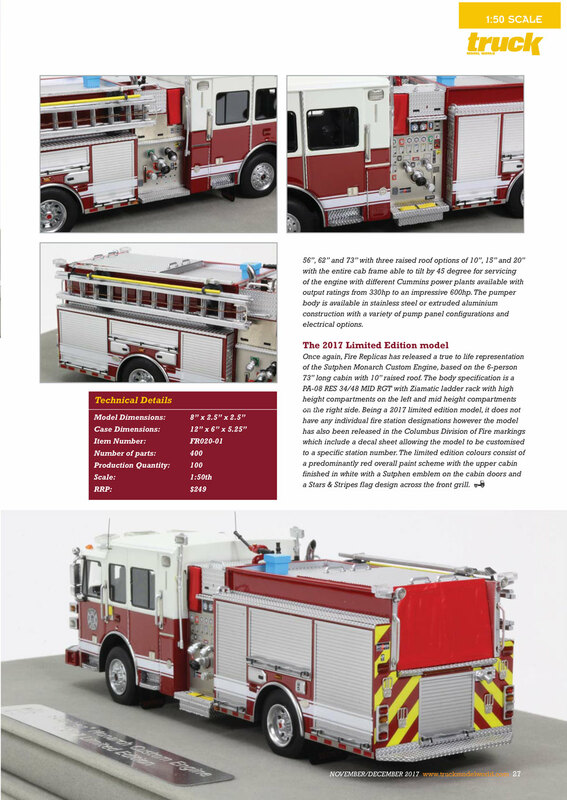 Fire Replica's has captured such an incredible high level of quality to their replica fire apparatus models that nothing is missed or done in a cheap appearance. This new Sutphen is truly the closest thing to the real rig, they have even gone the extra to apply a new American flag style grill as well as the appearance of the grill is a different style that Sutphen offer's as well as the federal Q siren mounted in the grill vs. the bumper. Attention to detail is truly impeccable, this Sutphen engine replica is a beautiful model so highly detailed shinning in its case. I have several Fire Replica's piece's all are incredibly wonderful, each new one seems as awesome as the last. I have always had a passion for fire apparatus and collected scale model fire apparatus since a child. I am so very thankful for this company to be producing such incredible fire apparatus scale models for collector's like myself, never before have I seen such truly awesome scale model fire apparatus. Fire Replica's fire apparatus models are truly museum quality scale replicas. Please keep up this wonderful production of fire apparatus model replica's, can't wait for future planned apparatus from other department's. Once I opened the box I realized why they say there’s “Nothing's built like a Sutphen” The white over red colors have a perfect break line similar to a real truck, your eyes are drawn to the front of the cab, the american flag grill with the siren mounted in it, the light standards standing out proudly on each side of that grill. Not over done are the simple demo graphics above the grill and on the door, which are very crisp. The magnificent detail on the pump panel and the extra’s in the crow’s nest add to the beauty of this truck, there is no doubt a Sutphen platform will look awesome next to this model. If you are a fan of Sutphen trucks this is surly one you want to add to your collection.